What we have here is, in short, a vintage cylinder player with a new motor and a new arm. It was built in about 1989 by Ian Gilmour, who is now head of research at the National Film and Sound Archive of Australia. The player is an Edison Standard Model D. If it does not seem really familiar, that may be so because it has been turned around, so that we here see it from the rear, and the original reproducer and its carriage rod and feed screw have been removed. Also, the cover for the gear mechanism has been removed, as have the gears themselves, and replaced by a heavy flywheel to keep the mandrel spinning smoothly. What remained of the Edison was then placed on a bigger wooden box that could house the Studer capstan motor that drives it now, along with its circuitry. The belt is actually made of 1/4 inch magnetic tape. The controls at the front of the black box are (from the left) the power switch, the high/low speed switch, the varispeed on/off switch and the varispeed adjustment potentiometer. So the player has two fixed speeds, 226 and 113 rpm, and two ranges of variable speed, 83 - 190 and 164 - 380 rpm. Speed is measured at the flywheel with an optical tachometer. The tonearm os a Souther TQ-1, from the company now known as Clear Audio. On its right hand side can be seen the lever that lowers and raises the tone arm. Cartridge is a Stanton 680, 681, or sometimes an 881, with selection of styli based on original Stanton but often reengineered by Expert Stylus, UK. Preamplifier is an Elberg MD12. 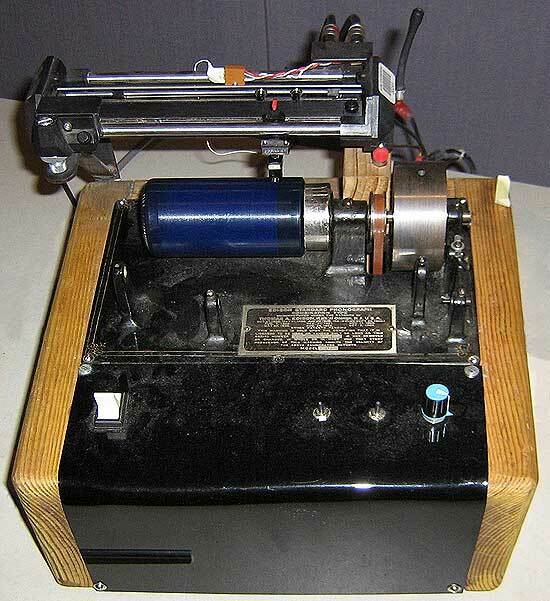 The earliest known Australian wax cylinders, from 1896, were transferred on this player, and can be heard at the NFSA site. When searching the archive, use the search term "wax cylinder". The term "Digital items" in the results list means there is sound to be heard over the internet.